Versatile and lightweight, WST Schedule 5 Light Wall fire sprinkler pipe gives your customers the outstanding hydraulics of a large ID in a USA-made pipe that’s quick-to-install and strong, 100% steel. WST Schedule 5 Light Wallis ideal for downsizing tubing requirements in a variety of applications. It’s also quick to install and has high corrosion-resistance ratios. Made in the USA, WST Schedule 5 Light Wall is UL® and C-UL listed, meets ASTM A135 and A795 standards, and is FM approved for use with standard roll groove and welded joining methods. Depend on Wheatland for the industry’s broadest offering of fire sprinkler pipe. It’s all American made and readily available. We MAKE IT eZ. If you design and install fire protection systems, you may face new risks. 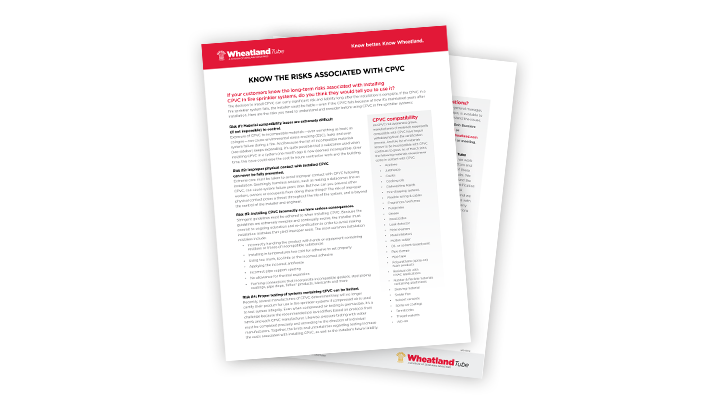 That’s why Wheatland has published the CPVC Issue Briefing. This free report has the information you need to understand the situation. And rest assured that Wheatland guarantees its steel pipe is 100% compatible with systems that use only 100% steel pipe in the fire protection system. 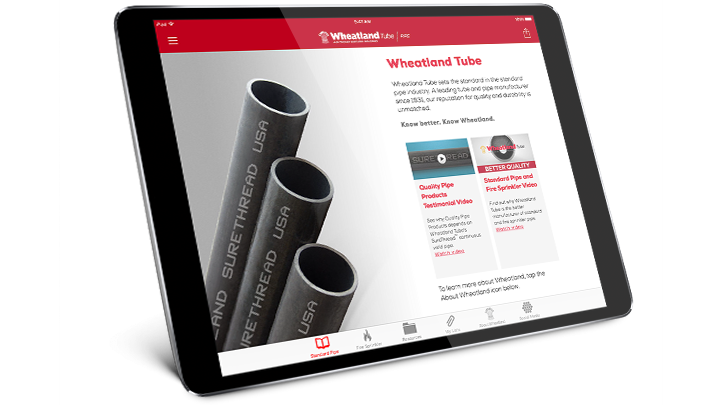 The Wheatland Pipe app enables professionals involved in the mechanical and fire protection industries to view Wheatland’s full line of steel pipe products from their iPad device, including specifications, code information, and helpful videos and technical briefings on industry-related topics. See how we MAKE IT eZ for you to work with us to meet your customers’ needs. Get complete details about our fire sprinkler pipe products. See all of our WST Schedule 5 Light Wall resources.